A Small Break can do you some Good in Week Thirty Six ! Well I needed a little time to get more supplies and to work on this technique for this weeks entry. I have wanted to start playing around with adding color to my metal piece and this was my first creation in which I used a patina in my work. I sketched this series of pieces a while back and I have been working on getting the colors I wanted. 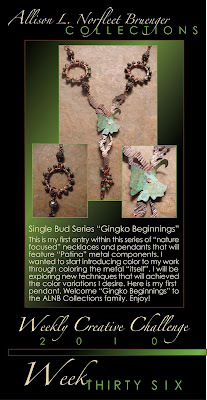 As time goes on, I will be adding new pieces to the series I call my "Single Bud" series. I also got to experiment with wire wrapping as well with this pendant. At my job they had a wonderful bracelet making class and I love the techniques so I used it as a decorative link in this pendant as a added source of texture and color. I love learning new techniques and merging them into my design style. I thank Mariah M. for the wire wrapping lesson and I look forward to showing more designs from this series very soon.